Posters are go-to promotional tools for marketing and political campaigns, event announcements, and business advertising. Bulk poster printing gets the word out on a major announcement. UPrinting’s wholesale deals let you maximize more at a lower price. We offer three standard poster sizes. The dimensions will depend on what you have to say and where you intend to display the posters. 11” x 17” is a smaller size normally seen on posters displayed outdoors. It is big enough to be seen from a short distance and fits in public spaces such as bulletin boards. 18” x 24” is the standard medium size for advertorials, campaign designs, and other mass promotions. 24” x 36” is the standard for large posters that promote big events such as concerts or are used as decorative displays. Ideal for announcements seen in outdoor venues. If your preferred size is not among the choices, then you can request for a custom size on our online calculator. Which Materials Should I Choose for My Personalized Posters? We narrow down your choices to 2 flexible paper materials and 2 durable card stock options. How Many Posters Can I Order? You can order as little as 25 pieces to more than 1,000 in one order. 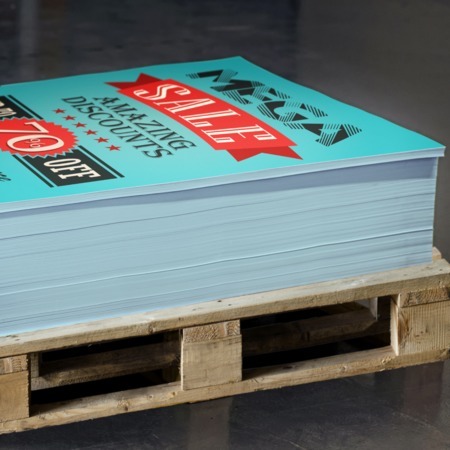 When you buy posters in bulk, opt for a number that will cover all your designated promotional places. How Should I Go About My Poster Design? Keep these tips in mind while creating your personalized posters. Stay on brand. The poster design should be consistent with your brand’s messaging. Customers should immediately identify who you are and the lifestyle you are selling. Keep things concise. A visually captivating design will get their attention. But the important information on your event and company should stand out. Make sure crucial info such as the venue, website, and contact details are the easiest to read. Color a customer’s world. Use colors to captivate and sustain a customer’s attention. The combination must lead the customer to the key details on the poster. Make sure the chosen hues are complementary. When can I expect my wholesale poster printing order? Bulk posters can be ready after 1 business day. The posters are shipped after you have approved the PDF proof for printing. Select “Estimate Shipping Cost and Delivery Date” to find out the exact arrival of your order. Alternatively, those who live near Van Nuys and Santa Monica Blvd. in Los Angeles can select the pick up order option. Check out our guide on our Los Angeles offices for more information. Which material should I choose for posters displayed outdoors? We recommend displaying our bulk posters in indoor areas for maximum impact. If you need a display that lasts long outdoors, it’s best to opt for a mounted poster. Do the posters arrive wrapped and bundled upon delivery? We offer shrink wrapping for our smallest sizes, 8.5” x 11”, 11” x 17”, & 12”x 18”. If you choose this option, a clear plastic film wraps around the posters and separates them in sets of 25 or 50 for easy counting.